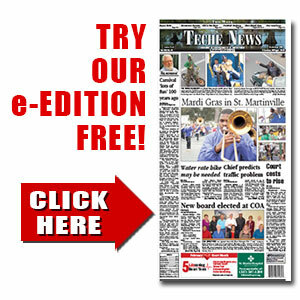 A Night at the Opera | TecheToday.com | Teche News | St. Martinville, La. St. Martinville – Neither deep water nor closed roads kept area opera fans from finding their way to La Maison Duchamp for the André Courville concert on Saturday afternoon. Acadiana’s favorite opera singer, the young bass-baritone sensation from Henderson filled the room with nearly 150 ardent supporters and made it well worth the trouble caused by local flooding. The effortless power of his booming voice and his polished delivery was all the more impressive in the small venue of the 1876–vintage St. Martinville landmark. He often performs in huge venues and for audiences in the thousands. In September of 2015, he sang at a speech by Pope Benedict in Philadelphia before an audience of 40,000. Accompanied by Geraldine Hubbell on the piano and, on two duets, by the very talented Broussard native, soprano Andrea Mouton, Courville sang selected pieces in Italian, including two selections from Don Giovanni by Mozart, Caro mio ben by Giordani and Vi Ravviso by Bellini. French pieces included Chanson Trieste by Duparc, the slightly scary Vous qui faites l’endorme from Faust by Gounod and Thomas’ Le Tambour Major from the opera Le Caid. Courville also performed several pieces in English, from Copland, Kern and others. He and Mouton sang the amusing duet An old fashioned wedding from Annie Get Your Gun. by Irving Berlin. He also displayed his own considerable talent at the piano, accompanying himself on Without a song by Youmans as an encore. Courville will return to Philadelphia and New York City soon to begin rehearsals for his next project, the opera Rigolletto, which opens in November.